In 19th century Victorian England, an unknown serial killer brutally murdered five prostitutes between August 31st and November 9th of 1888 and was never caught by the police. He received the nickname of "Jack The Ripper" after the signature from a letter, that was supposedly written and sent by the gloating assassin to the Scotland Yard and printed in the newspapers of the time. Chief Constable Melville Macnaghten investigated the case and wrote a final report naming five suspects. This is the second entry in a series of a hidden object games based on actual murder cases. 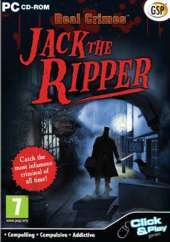 As Macnaghten and the notorious forensic scientist Francis Galton, the player must search and click on all the items listed at left side of the screen, on locations related to the case and filled with assorted objects. Some of the items are clues about the murders, bringing up a window at the center of the screen with details about the object and its relation to the case. The hint button is a police badge below the list, that shows the position of one of the required items when activated. Police badges can be found and collected from the scenery for extra hints. A few mini-games appear between locations, where the player has to complete a jigsaw puzzle with pieces of a shredded letter, a tile-sliding picture puzzle, a spot-the-differences game with two similar images, a memory game with matching tarot cards and other similar challenges. There are two modes: Detective Mode with a time limit of 10 minutes per scene, and a Rookie Mode without any time constraints. Extra seconds can be added to the timer by collecting the fingerprints pressed over the scenery.